The hardest part of a manager's job isn't staying organized, meeting deliverable dates, or staying on budget. It's dealing with people who are too comfortable doing things the way they've always been done and too afraid to do things differently—workers who are, as author Bill Treasurer puts it, too “comfeartable.” Such workers fail to exert themselves any more than they have to, equating “just enough” with good enough. By avoiding even mild challenges, these workers thwart forward progress and make their businesses dangerously safe. To combat this affliction, Treasurer proposes a bold antidote: courage. In Courage Goes to Work, he lays out a comprehensive, step-by-step process that treats courage as a skill that can be developed and strengthened. Treasurer shows how managers can build workplace courage by modeling courageous behavior themselves, creating an environment where people feel safe taking chances and helping workers deal with fear. To make the concept of courage more concrete, Treasurer identifies what he calls the Three Buckets of Courage: Try Courage, having the guts to take initiative; Trust Courage, being willing to follow the lead of others; and Tell Courage, being honest and assertive with coworkers and bosses. He illustrates each with a variety of vivid real-world examples and offers proven practices for helping your workers keep each bucket full. Aristotle said that courage is the first virtue because it makes all other virtues possible. It's as true in business as it is in life. With more courage, workers gain the necessary confidence to take on harder projects, embrace company changes with more enthusiasm, and extend themselves in ways that will benefit their careers and their company. 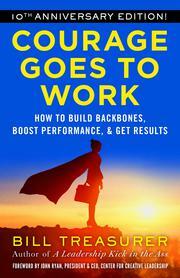 Courage Goes to Work is the first book to take a systematic approach to developing a vital but overlooked component of business success.